The sociologist Zygmunt Bauman’s last book, Born Liquid, consists of a conversation with the Italian journalist Thomas Leoncini. It is a book which speaks of the experiences of those born after the mid-1980s – a generation that was ‘born liquid’ and thus feels at home in a society of constant flux. I was born in 1987 and this is the generation I am part of. His observations are, thus, challenging but worrying. In December, the New York Review of Books published an excerpt from this book. There are two striking elements which are discussed – bullying and evil. With regards to bullying, he chillingly recognises that the “demand for bullying – for its objects and its reasons – never goes to sleep”. This becomes very apparent when one reviews the current political landscape. The strongman has returned to public life with a vengeance. Behaviour which was once marginalised and shunned in public life – aggression, undue coercion and violence – is now cheered. Public debate, particularly on the internet, often descends into exchanges characterised by crude language, ill-mannered behaviour and gratuitous vulgarity and loutishness. The anonymity provided by the internet undoubtedly fuels this behaviour. Whether our politics encourage the climate of aggressiveness on the internet or whether internet debates fuel political rhetoric is a moot point. There has been an effect in that, as politicians became more aware of the need to engage on social media, they also adopt some of the coarseness used on the internet. In some cases, they choose to channel the anger and aggressiveness without any regard for the weight that their words carry. The recent 18-day standoff over 49 migrants stranded in the middle of the Mediterranean Sea in harsh, cold, stormy winter conditions is one such example. This saga unfolded over social media and emotions ran high. These debates manifested themselves in the political discourse used. There are some facts which need to be made clear before attempting to discuss this matter. Firstly, the issue of a workable migration policy remains an urgent matter, and an open border solution is neither desirable nor warranted. Secondly, this was not a crisis of Malta’s doing. Malta was not the nearest safe port when these migrants were rescued. The long standoff at European level and the reluctance of various governments to safeguard the dignity and the safety of these individuals showed the world a side to politics which was previously relegated to the fringes. This has now become the norm. 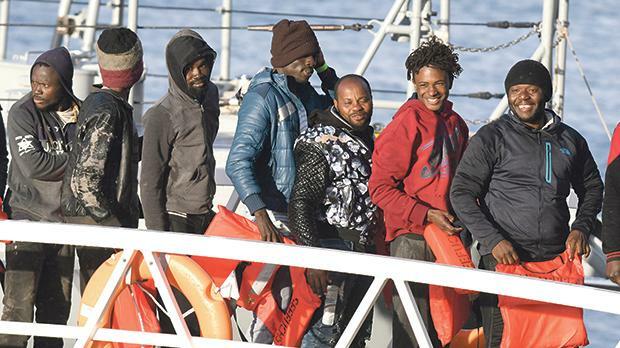 The intransigence and callousness exhibited by the Italian Minister of the Interior, Matteo Salvini, is particularly shocking. In this case, the politics of the strong man manifests itself in bullying behaviour – the need to prove a geopolitical point at the expense of the dignity and the safety of 49 people. Judging by the wanton commentary on social media, this course of action had the approval of several individuals. This is just one case that exemplifies how, in our liquid generation, the assertion of force and the idea that “might is right” have become political plus points. The second point addressed by Bauman concerns the trivialisation of evil. Bauman writes that new events tend to shock solely because they are new. However, when similar events take place on a regular basis, they lose their ability to shock regardless of how “appalling and horrifying they might have been at their first appearance”. Indeed, such events become normalised. Part of this trivialisation is because “doing evil no longer demands motivation”. Much like bullying, watching others do evil may become a “pastime and entertainment” for some. Even in this regard, we are spoilt for choice for examples. Two events from the closing months of 2018 can be cited. The first is the mass-shooting in Strasbourg during the December plenary session of the European Parliament. This left five victims and countless others injured. The second is the New Year’s Eve stabbing in Manchester which left three people fighting for their lives. These stories were forgotten just hours after they happened. These join a list of other horrific manifestations of evil – casual mass shootings (13 people died from such shootings in the United States during December 2018), the cultural encouragement of substance abuse, the dehumanisation of those who do not share our point of view, the relaxed attitude to violence in all its forms and the general disregard for human life. These often go unreported. Perhaps, the trivialisation of evil is best summed up in the triumph of a culture of death – a culture which was eloquently summed up by Pope Benedict XVI as an “escape from reality in the illusory, in a false happiness that manifests itself in lies, in fraud, in injustice, in contempt for others, for solidarity, for responsibility vis-à-vis the poor and the suffering”. Where does this leave our generation? I believe it should force us to take a hard look at ourselves, at our values, at our attitudes and at the worth we assign to the concepts which we have long taken for granted – the value of human life, the importance of dialogue and the democratic system. The desire to show superiority coupled with the indifference to evil is a lethal combination. If we choose to encourage this attitude, we are complicit in a dark attempt to undermine our societies and our well-being.